August 25, 2017 at 7:44 pm. 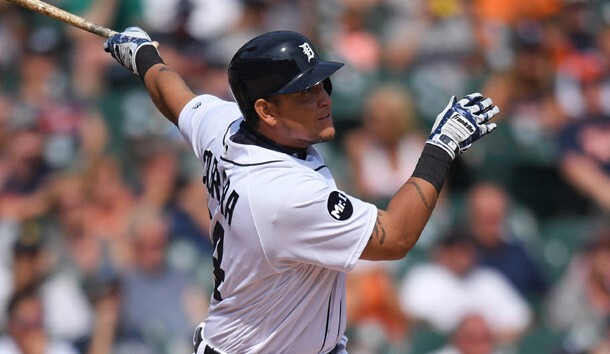 Detroit Tigers standout Miguel Cabrera was suspended seven games due to inciting the bench-clearing brawl during Thursday’s game against the visiting New York Yankees. Wilson’s penalty was for intentionally throwing a pitch at New York’s Todd Frazier after warnings were in place for both sides. Romine received a two-game suspension for his actions, which included throwing punches at Cabrera. Tigers manager Brad Ausmus was suspended for one game due to Wilson’s action while a warning was in place. –The Seattle Mariners outrighted outfielder Leonys Martin to Triple-A Tacoma. Martin was designated for assignment on Wednesday and the Mariners had seven days to trade, release or outright his contract to the minor leagues. Martin, 29, batted .174 with three home runs and eight RBIs in 34 games with Seattle this season. Martin was acquired by the Mariners from the Texas Rangers on Nov. 16, 2015. The native of Cuba has appeared in parts of seven major league seasons with the Rangers (2011-15) and Mariners (2016-17), posting a career batting average of .248 with 38 home runs, 175 RBIs and 114 steals in 606 games. –The Oakland Athletics placed right-hander Paul Blackburn on the 10-day disabled list with a right hand contusion. Blackburn, 23, left Tuesday night’s start in the fifth inning against the Baltimore Orioles after a liner struck him on the right wrist. The move is retroactive to Aug. 23. Blackburn, who was recalled from Triple-A Nashville on July 1, is 3-1 with 3.22 ERA in 10 starts with Oakland in his debut season. He started on Tuesday at Baltimore and tossed four scoreless innings before he was hit on the hand by Trey Mancini’s comebacker to lead off the fifth inning. The Athletics also recalled right-hander Michael Brady and outfielder Mark Canha from Nashville.